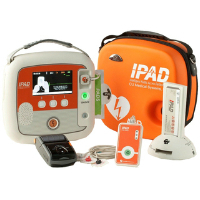 The new iPAD SP2 is the latest in the range of Inteligent Public Access Defibrillators. The SP2 is an easy to use AED (Automatic External Defibrillator) which has a manual override function and is both compact and light, but at the same time able to deliver the features of a much larger and expensive AED. The SP2 automatically reads the patient's electrocardiogram (ECG) and determines if a cardiac arrest that requires defibrillation has occurred. This ECG is also shown on the new larger colour screen, adding to its civilian usability by adding confidence in being able to see what is occuring whilst also hearing it through the voice prompts.